I was born and have spent the most of my life in Russia, in the city of Leningrad (nowadays St. Petersburg). My mother worked as a veterinarian. The first German shepherd dog was obtained by her family long before the Second World War. One can say that the love towards dogs is genetically embedded in me. My first own dog was an Airedale terrier female named Darling, which was obtained in 1973. I wanted Darling to become a good working dog, so I trained her with a great enthusiasm. And we achieved outstanding results! Darling got highest results (diplomas of 1st degree) in 6 various working dog trials and won numerous competitions. I took her even for a bear hunt training; and my dog worked equally well as laikas. Darling has also given me the experience of participating in dog shows and raising puppies; she gave birth to her first litter in 1976. As a result of my active work, the board of the Airedale terrier club sent me to the dog judge courses. In 1980 I became a dog show and working trials judge. My first Miniature schnauzer - Aki Klepac was brought from Czechoslovakia in 1978. She became the foundation female of my kennel – Tmavi Knir, which is the oldest Miniature schnauzer kennel in Russia and the countries of the former U.S.S.R. I have been a chairman of St. Petersburg Schnauzer club and show committee of the famous “Schnauzer Show” for a long time. My work in judging and breeding had been honored several times by different awards. In 1998 I became the honorary member of DOSAAF, the Working Dog Club, of St. Petersburg . The "Miniature schnauzer" book, the first of that kind in Russian language, published in 1999 became a result of my 20-years-long Schnauzer breeder's career. My family moved to Finland in 2000. I had 23 dog breeds in my judge list when we moved there. For the time we have lived in Finland black and black-and-silver Miniature schnauzers from Tmavi Knir kennel have been acknowledged 12 times as "Best Winning Miniature schnauzer of the Year of Finland". In 2011 I was awarded with golden mark of Finnish Pincher Schnauzer Club. 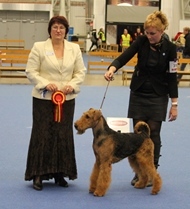 In the beginning of 2013 the Finnish Kennel Club acknowledged me as an International Allrounder Judge. This year I will celebrate several anniversaries: 40 years of my cynological work and 35 years in Miniature schnauzers breeding. During these years more than 50 National and 10 International Champions have been born in Tmavi Knir Kennel as well as World Winner and Reserve World Winner. In 2013 our kennel has received Vuolasvirta prize from Finnish Kennel club as a recognition for exceptional breeding work. Besides German shepherds, Airedale terriers and Miniature schnauzers, we had Dobermanns as well in our home, which belonged to my husband. He ceased his work with that breed after the ban on ears cropping and tails docking had come into force.